jBilling now offers a complete integration with SugarCRM, one of the industry’s leading CRM solutions. This integration gives users a single access point to view real­time billing information as well as the ability to process payments, issue refunds, manage subscriptions, and more all from within the CRM system. To put it simply, SugarCRM acts as a ‘front end’ where an administrator has complete control over managing relationships. In addition to that, jBilling runs in the ‘back end’, generating invoices, and keeping SugarCRM up to date with all important billing information for the customer. This integration allows an administrator to create a customer account in SugarCRM that is ‘linked’ to a customer account in jBilling. This means that, account name, email address, address, credit card, sub-accounts, etc., entered in SugarCRM, will be available in jBilling. A customer account can be created in jBilling at any time, for example, after they agree to the terms of a quote. Any information created in SugarCRM will be updated immediately in jBilling. Please note that it is not mandatory to provide credit card information for the customer account. 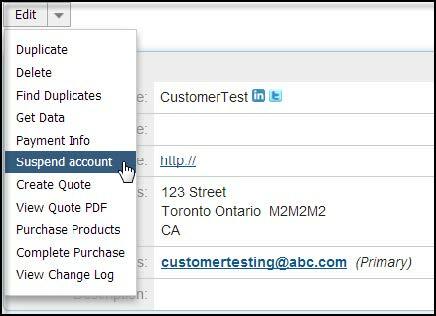 Once the customer account is available in both SugarCRM and jBilling, it is possible to activate or suspend the customer account at any time, by selecting the appropriate field from a dropdown menu. 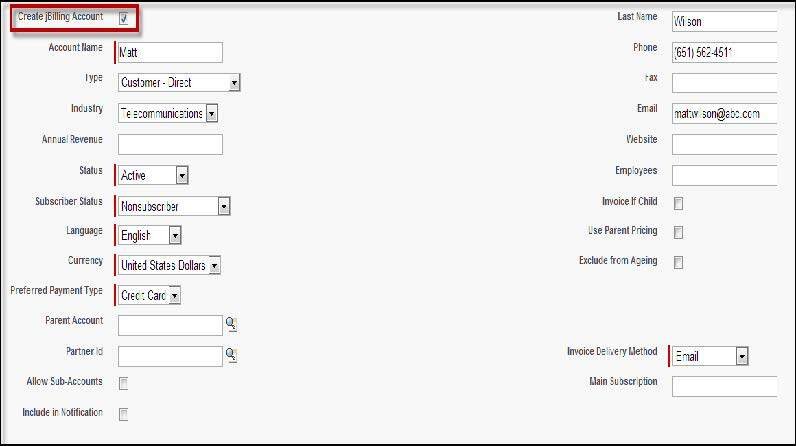 SugarCRM also enables an administrator to select the primary currency the customer account will use. 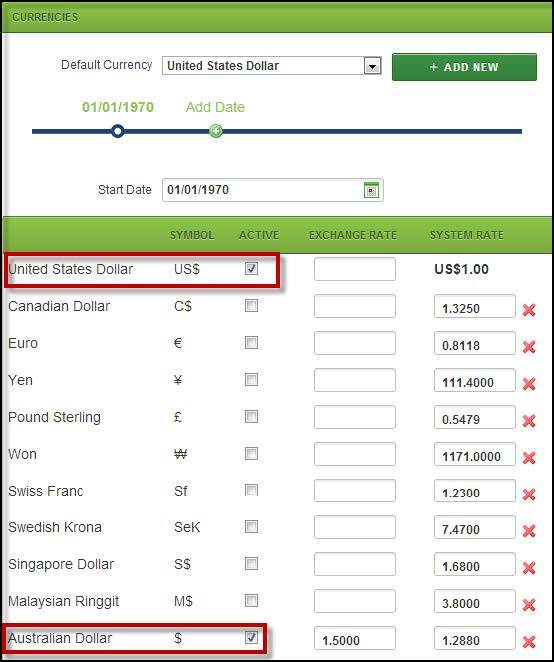 The available currencies are configured from jBilling. SugarCRM utilizes jBilling by enabling an administrator to use products and pricing retrieved in real-time to create a quote for an existing SugarCRM customer account. Once a quote is created, it is possible to email it to the customer account for approval. 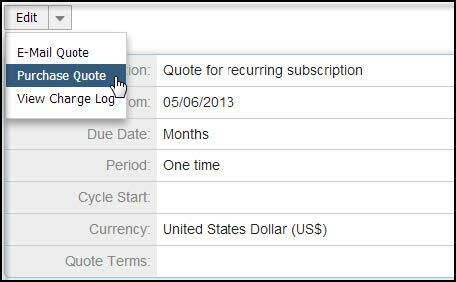 The custom terms that were selected during the quote creation process will be included. 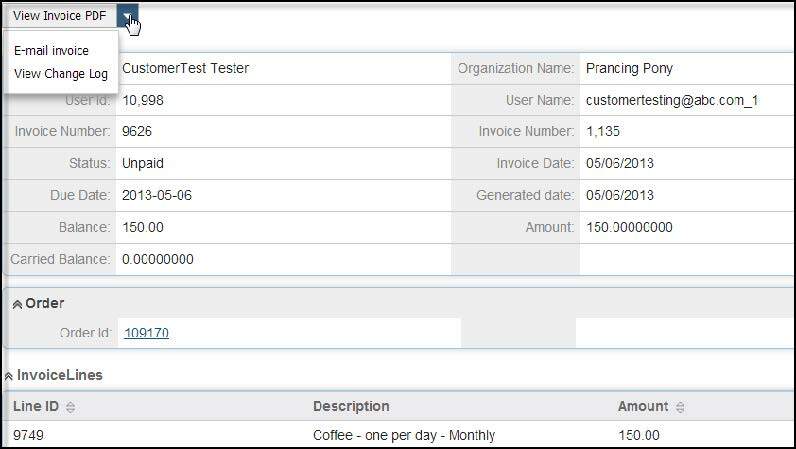 After the customer account approves the quote, an administrator can purchase the quote in SugarCRM..
At that point, the quote is generated into a subscription, and can be located in under the ‘orders’ section of the customer’s account. In real­time, jBilling will create a purchase order with the same details for the correct customer. There may be certain situations where the creation of a quote is not required because the customer is ready to go ahead and make the purchase. Functionality is available in SugarCRM that allows an administrator to create a subscription. This screen looks identical to the ‘Create Quote’ screen, except it is not possible to select Terms. An administrator can set parameters like, start date, end date, whether the subscription is pre­paid or post-paid, and how often the customer should be billed. It is also possible to add products and/or plans, change the quantity, and even alter the rate or percentage amount. Once a subscription is saved, jBilling will automatically create a matching purchase order. 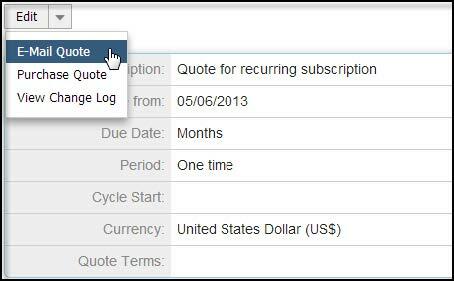 If for any reason, changes are made to the order in jBilling, the subscription in SugarCRM will also be updated.. 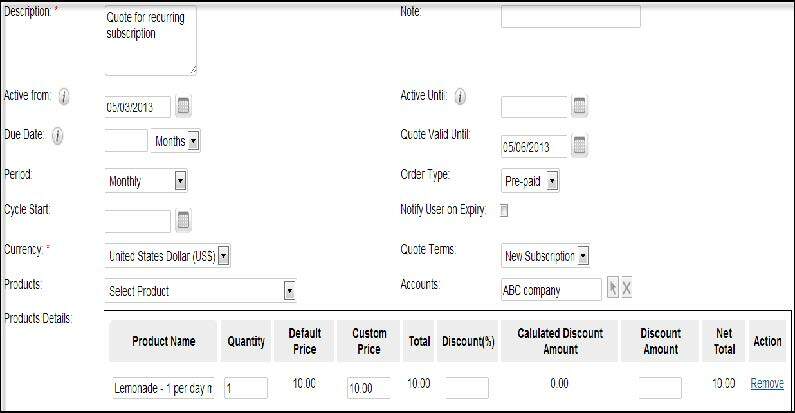 When subscriptions from SugarCRM become available as purchase orders in jBilling, the customer account is ready to be invoiced. Here’s where jBilling’s billing process comes in. 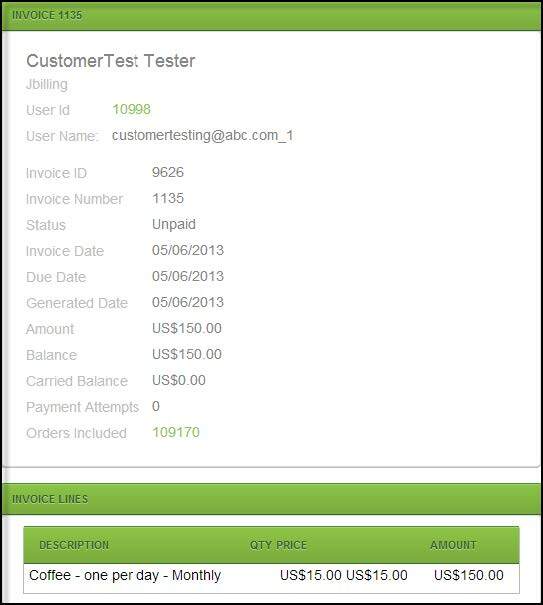 The scheduled process will automatically generate invoices from purchase orders.. 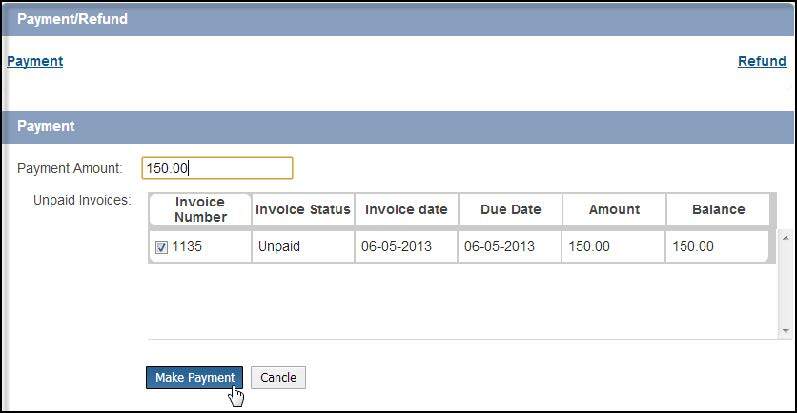 When an invoice is created, the customer account in SugarCRM will be updated in real­time. The exact same invoice created in jBilling will be available in SugarCRM to view, print, or email to the customer account. If payment information has not yet been set up for the customer account, it is possible to add it at any time. Once saved, the information will be available in jBilling. It is also possible to refund the customer for a payment. Please note that currently, it is only possible to give the customer a full refund, however customization can be done to extend this functionality..
Any time a payment or refund is made in SugarCRM, jBilling is updated in real­time. A payment will be automatically created and associated to the invoice.